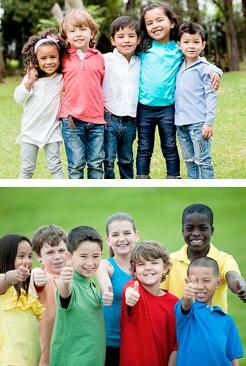 through affordable mental health counseling and social service programs. NFSB IS ON AMAZON SMILE! Support NFSB when you shop on Amazon. NFSB is happy to announce it is now a registered charitable organization with the AmazonSmile Foundation! This program is a simple and automatic way for you to support NFSB every time you shop, at no cost to you. With just a click when you order at smile.amazon.com, 0.5% of the price from your eligible purchases will be donated to NFSB services. Smiles all 'round! In this free program, elementary school children learn how to interact in ways that are optimally communicative and socially appropriate with a focus on skills for effective listening, reciprocal responsiveness, self-reflection, behavior modulation and heightened sensitivity to others. This workshop will be taking place every Tuesdays, from 5:00 pm to 6:00 pm (Group A - Ages 5-9), and from 6:00 pm to 7:00 pm (Group B - Ages 10-12). For further info please contact Nutley Family Service Bureau (973- 667-1884) to enroll or for questions. 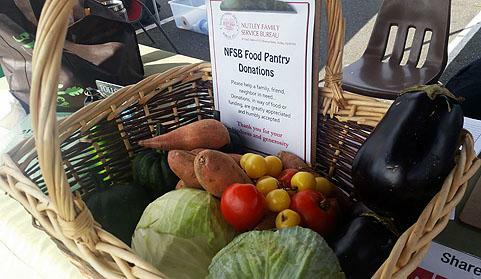 NFSB applauds Nutley Farmers Market's effort to give eligible residents more opportunity to purchase fresh fruits and vegetables by honoring double values for Senior Farmers Market Vouchers. This program is made possible by a grant from New Jersey Healthy Communities Network funded by Partners for Health Foundation. Contact Nutley Health Dept for more info. NFSB appreciates the generous and ongoing support of Investors Bank! 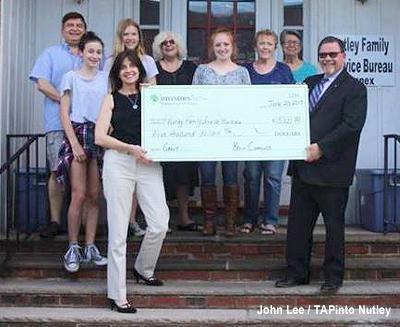 Neil B. Conlan, Assistant Vice President, Branch Manager - Nutley Branch of Investors Savings presents a check in the amount of $5000 to Eileen Painter, Executive Director Nutley Family Service Bureau.